Torres Del Paine translates to "Towers of Blue." Cradled deep within the Southern Andes, the park is known as the crown jewel of South America. Its glaciers, rock faces, lakes, plains and mountains leave nothing to the imagination. It's all there, resplendent with beauty no photograph can capture. Nonetheless, on Yoni's and my South American adventure, we tried our best. The story of how we actually got there is quite entertaining, but I'll save that for another post. For now, I hope you enjoy some of our favorite shots of this exquisite national park which is the most beautiful place I have ever witnessed. The Salto Grande is the largest waterfall in Torres Del Paine. A short drive from the South entrance of the park, it is about a third of the way through the prettiest hike in the entire park. BONUS: There is a rather fat armadillo who lives near the beginning of the hike. He can be found burrowing around dusk and making quite a mess of the trail. Cute Cow ... I mean bull. These two spindly towers are "the" towers that they mean in the name, Torres Del Paine. Not sure of why these ones get all the glory. Don't get me wrong. They're cool. But I'm in love with the bigger mountains around them. This hike was crazy steep. Don't do it. Do the nice one, near the bottom of Lago Grey. Seriously. The one up the mountain, It practically killed me. But it was pretty. But not pretty enough to justify the insaniac climb. There are only 600 or so huemel in the entire world, so we thought it was pretty cool to see them. Still not cool enough to justify that hike, but cool, nonetheless. Guanacos are totally unafraid of humans. This lack of fear nearly led to their extinction. Guanacos are related to llamas and camels and they're extremely entertaining. Cave Drawing ... ... ... ? Goucho is another fun word that begins with G. It means cowboy and they hang out in Torres Del Paine. If you're lucky, they'll take you for a ride. My mind changed about 35 minutes later. About 5 minutes after this picture was taken my horse bolted. Once the horse threw me off, the goucho took over. 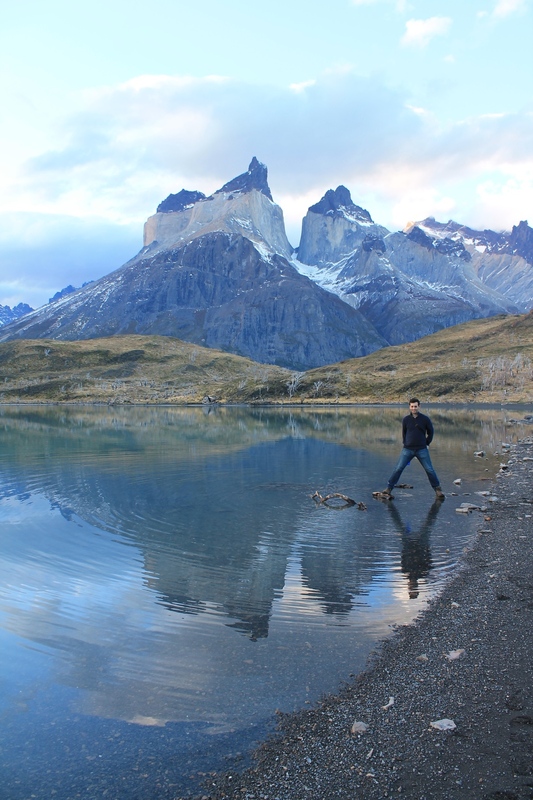 TORRES DEL PAINE: IF YOU'RE GOING to Torres Del Paine National Park, You can get more information here. We stayed and ate most of our meals here. We rented a car here. While we opted for a hotel but there is a 3-6 day hike (depending on your pace) called the W and a 5-10 day hike of the entire park called the Full Circuit. There are campsites and little hostels along the way to stay at. If you do the W, make sure to make time for some of the smaller trails. There is a short and easy hike out to Lago Grey where you can see amazing glaciers. Despite its relative ease and obscurity, the hike around the Salto Grande (Big Falls) up to and around Nordenskjöld Lake is said to be the most beautiful in the park and should not be missed. We flew this airline (6 flights, no lost bags and generally on time) and they served remarkably good food free of charge. You might want to tack a few extra days on to see this (which we did see. there is a similar glacier at Torres Del Paine, but the Perito Moreno gLacier is pretty amazing, nonetheless) or this. What is the most beautiful place you've ever been? We want to know (and maybe want to visit!). Give us your travel tips! Either email them to us at fivetdsisters@gmail.com or leave them in the comment section below. Can't wait to hear from you.